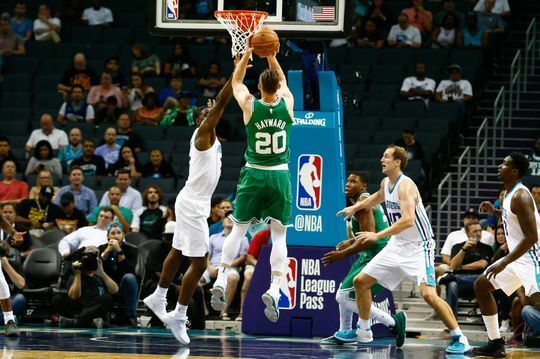 The Boston Celtics close out their unblemished preseason schedule with another win over the Charlotte Hornets, 108-100. Kyrie Irving notched a double-double scoring 16 points on 7 of 11 from the field (2 of 3 from three) to go along with 10 assists and 5 rebounds. Al Horford was outstanding as well hitting 6 of his 7 attempts from the field, including all three from the outside, while snatching 8 rebounds and 4 assists. The Celtics as a team shot 50% from three (16-32) and moved the ball with great efficiency for a team in just it's 4th game after the offseason roster overhaul. For the Hornets, rookie Malik Monk led the team with 21 points hitting 4 of his 10 attempts from three. Dwight Howard started the game strong and finished with 12 points and 6 rebounds on 6 of 9 from the floor. The Hornets did their best to attack the Celtics interior with Dwight Howard early. He went 4 of 5 for 8 points and a pair of boards in the 1st, keeping his team within striking distance at the end of the opening frame (24-20, Celtics). #Celtics lead #Hornets 56-38 at halftime. Irving wth 14, Brown 10, Horford 7 and 6 rebs. The C's starters came out to start the 2nd half and the hot shooting carried over with them. They hit 4 of their first 5 shots from deep and midway through the 3rd quarter and they were shooting 73% from three and led by 18 points (75-57). With the C's up big the starters hit the bench late in the 3rd, and they looked to close out the game with their reserves led by Rozier. The Hornets rallied behind Monk and their 2nd unit, pulling within 3 points after a make from deep from their rookie shooting guard. They then took the lead for the 1st time since early in the 2nd quarter behind back-to-back buckets from big man Johnny O'Bryant. The C's managed to hang on, and a pair of buckets from Shane Larkin to close out the game put the Hornets away. The next game counts, as the Celtics tipoff the NBA season next Tuesday against the Eastern Conference champs, the Cleveland Cavaliers.